It's no secret that the U.S. education system is hurting, especially when it comes to science teachers. Public schools are chronically underfunded, and the most talented college graduates shy away from entering the teaching profession when its future seems so grim. But hope isn't lost. A pioneering program at New York's American Museum of Natural History aims to make the future better for science teachers by starting a new kind of Master of Arts program in science teaching. Starting this June, the program will provide 50 teachers-in-training with a thorough education in Earth science, along with a year's classroom work experience, all while paying a modest stipend. The deadline for applications to the program is January 31 (yes, you can still apply), and there will be an open house for interested students who want to talk to faculty and staff this Saturday, January 7, from 12-4 at the museum. Funded in part by the National Science Foundation, and in part by New York State, this teaching credential program is what AMNH Senior VP Lisa Guggenheim hopes will be the first of many offered by "alternative institutions" (like museums) who can supplement what universities already do. 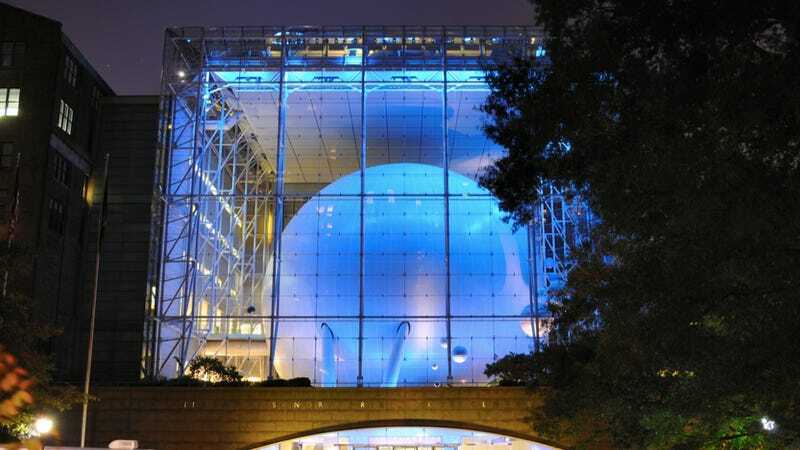 She told io9 that AMNH has been partnering with teachers for almost a decade, working with schools and teachers to provide everything from course materials to teacher training. But when Guggenheim heard that New York State was looking for ways to bring nontraditional institutions into teacher education, she jumped at the chance to create a program that would be aimed at teachers who didn't have their credentials yet. The AMNH program emphasizes Earth science, because it's the area of science education where teachers are needed most. "It also matched with our working scientists, and our collections and our halls. Those will be the content curriculum," Guggenheim said. I've toured the vast halls of the AMNH, which are packed with incredible collections of rocks, core samples, lava-making machines, and more — it's easy to see why the museum would make for a good teacher training ground. The museum faculty are excited to train teachers, Guggenheim said, "because they understand the multiplier effect. One highly skilled teacher reaches 100 kids or more per year. The multiplier effect of a teacher can be huge." The more our science teachers inspire us, in other words, the greater our scientific achievements will become. Another important part of the AMNH teacher training program is that it focuses on placing student teachers in underperforming schools, so that the benefits of science education reach the schools that need it most first. Student teachers will be working for 4 days a week in the classroom, translating what they learn in the halls of AMNH right into lesson plans. And each student teacher will also receive a fellowship to help support them financially during the 15 month masters program. Currently, the masters program is planned to train 50 teachers over the next two years. They'll be two cohorts of students, each studying for 15 months before getting their certification. After those 15 weeks, says Guggenheim, there will also be a support system in place to help the new teachers as they navigate the first two years of what can be a stressful, though rewarding, job. If the program works out, the museum will try to continue offering it - and will encourage other museums and similar institutions to create similar teacher training programs. It's encouraging to see nontraditional institutions stepping up to help keep American science education as good as it can be. Hopefully, it's a harbinger of things to come. "Science teachers have fared better than others in finding new positions in this market," Guggenheim says. "Students do have financial worries, but undergraduate science majors are an adventurous lot. There's been a lot of interest." If you're interested in the program, you can go to the open house this Saturday, January 9, from 12-4 at AMNH. For applications, click here.